The team of ten selected students from various district of Arunachal Pradesh today reached Ahmedabad in Gujrat to attend 25th National Children Science Congress 2017 to be held from December 27th to 31st. Arunachal Pradesh Science & Technology Chairman Bamang Mangha and Director C. D. Mungyak said that it is a great opportunity for our children that they have been able to reached the place in time while the facility from the department was fully provided for the students and escorts including the officials. Mangha said that this time the APSCST have provided air ticket for the participants so that they reached to the destination timey and safely without any problems which sometime the people of NE have to face in manland area. 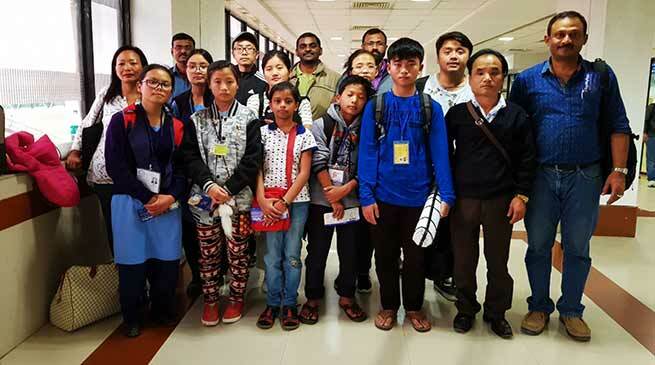 Ten participants who reached Ahmedabad yesterday are Gyati Ankha of VKV Nirjuli, Kiran Ngadong of VKV Tafragram, Passang Doima of VKV Shergiab , Sharmista Dutta of VKV Roing, Porvee Mosi of VPS Daporijo, Udaiso Krong of VKV Amliang, Lakpa Tsring Thungon of VKV Shergoan, Bakin Nasho of VKV Itanagar, Nongong Gamno of GHSS Kharsang, Thutan Tsomu of VKV Kitpi.